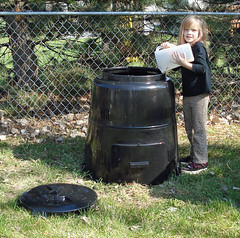 If you live in Lawrence, you can get one of these compost bins for $30 through the City of Lawrence. Pari is enjoying putting the kitchen compost in way too much. 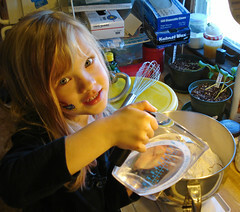 Pari helping me with a bagel batch. You can see the pumpkins in the background. 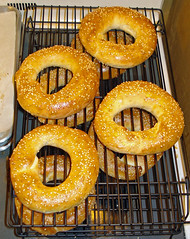 Experimental sesame rings. I think that the new spice didn't work out too well, but making some sort of salt ring with cardamom or caraway seed may be possible in the future. What I was thrilled about is that I got the texture of the dough pretty much perfect on the first try. I have learned something about making bread.